Maybe we’re a little bit biased, but we sure do love our little City by the Bay. There’s nothing quite like brunch at Park Tavern, or dancing and drinks at Blondie’s in the Mission. However – sometimes living in San Francisco can be challenging. When city life gets to be a little too much and we could use a break, the first thing on our minds is hitting the road and getting some much-needed fresh air. Whether you’re a camping newbie or a seasoned pro who feels at home next to a roaring campfire, there’s no doubt that northern California has some of the best camping spots in the country. From exquisite beaches to the secluded mountains (and occasional dormant volcano), here are the ones that come out at the top of our list! Beautiful Lassen Volcanic National Park is home to oodles of geothermal activity, as the park is one of the only places in the world where all four types of volcanoes can be found. Camp in one of the 179 campsites on the stunning Manzanita Lake, and admire the natural beauty of the national park; swim, kayak, and hike around the lake, too. The campground at Manzanita Lake has showers, flush toilets, even a coin-operated laundry. No camping gear? It’s available there for rent, or stay in one of an assortment of tidy cabins and bunkhouses. Punctuated by scrabbly earth and lava rocks, at first glance the Lava Beds National Park seems barren and desolate. But take a closer look. Go camping at Indian Well Campground, and snag one of the 43 campsites (as they are on a first-come-first-served basis). Sites can accommodate tents, pickup campers, small trailers and motorhomes up to 30 feet. The stunning McArthur-Burney Falls Memorial State Park is within the Cascade Range and Modoc Plateau natural region, with forest and five miles of streamside and lake shoreline, including a portion of Lake Britton. The park’s centerpiece is the 129-foot Burney Falls, which, although it is not the highest or largest waterfall in the state, it might possibly be the most beautiful! The park’s landscape was created by volcanic activity and erosion from weather and streams. Campers, keep in mind: there will be road construction near McArthur-Burney Falls Memorial State Park for the summer of 2018. Visitors traveling from Redding on Eastbound Highway 299 can expect delays from Johnson Park to Highway 89 junction with Highway 299. Spend the night sleeping under the giant redwoods. Pitch your tent at Jedediah Smith Redwoods State Park, northeast of Crescent City. Its 86-site developed campground sits beside the burbling, emerald green Smith River in a lush glade, complete with ferns and old-growth trees. You can walk from your tent to the 340-foot Stout Tree and its mammoth brethren, or go for a drive on spectacular Howland Hill Road – a 10-mile winding dirt road through old-growth redwoods. We would be remiss if we didn’t mention our beloved Lake Tahoe. 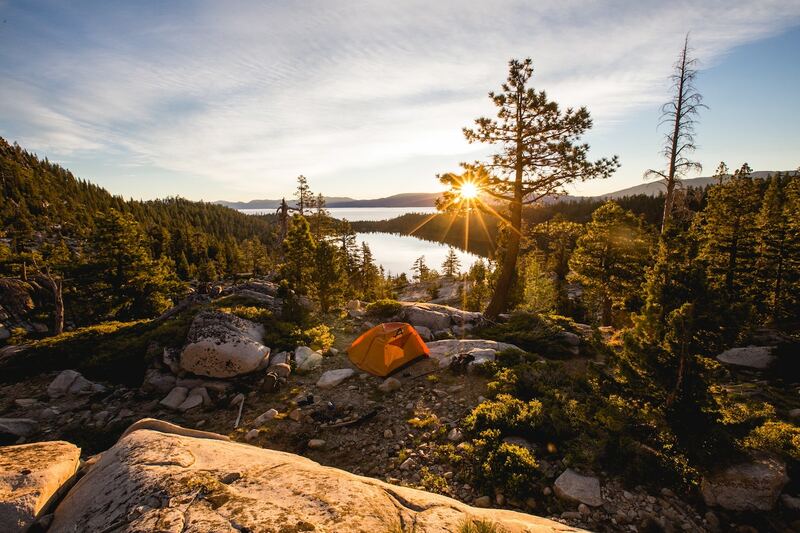 The camping at Lake Tahoe is beyond – between the majestic mountainous views and shimmering blue water, you can’t go wrong pitching your tent at Lake Tahoe. Some of the best campgrounds are in the Lake Tahoe area include Camp Richardson, Sugar Pine Point Campground, and Sand Harbor. Bike, kayak, and hike while taking in the fresh mountain air at one of California’s crowning jewels. Now, who’s ready to pack up the camping gear and hit the road? Remember that Metromile caps your daily mileage at 250/miles per day in California, so don’t worry about racking up crazy mileage – we’ve got you covered! If you’re not yet a Metromile customer, what are you waiting for? Get a free quote today to find out how much we could allow you to save every year!